On offer from us is available a broad assortment of Designer Curtain Rods/Metallic Painted Curtain Rods. Each curtain rod that we offer is manufactured by adept professionals who make use of optimum quality material and allied accessories. Stylish in appearance, these brackets curtain rods are specially designed in a manner to get in-tune with the interiors of residential and commercial structures. 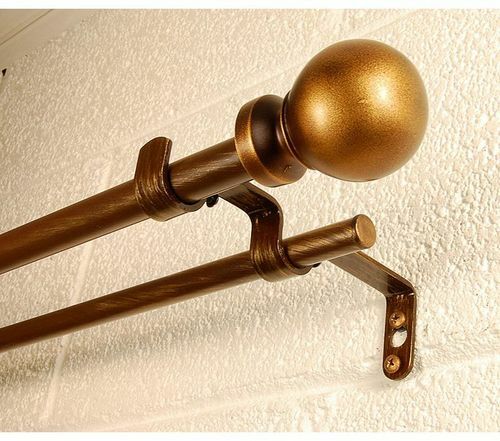 One can easily place curtain rods over the brackets conveniently, ensuring that these remain as it is for longer time. We, Chetna Industries, as a company was established in the year 2005. We are amongst the leading manufacturer and supplier of a wide range of Curtain accessories. We have achieved a legal status of a proprietorship firm. We have garnered immense appreciation for our product designs and serve a vast clientele. Our success can be attributed to our sound infrastructure and our team of efficient professionals. We follow a standardized production process so as to attain standard quality for every single product and provide customized solutions. We undergo quality control tests based on several parameters so as to maintain the requisite standard. We are highly principled and believe in engaging in ethical business dealings only.